Reel Tech, an Australian fluid mechanics company with over three decades of experience in hose and cable reel design and supply to heavy and process industries, is one of the few leaders in their field that specialises in both heavy- duty and custom reeling and hose handling systems, but also light weight robust hose and cable reels for both fixed and mobile applications. With full CAD design from clean sheet concepts, to custom manufacturing, as well as one of the largest ranges including off- the-shelf solutions, Reel Tech is the exclusive Hannay Reels distributor and service provider for Australia and New Zealand, servicing all industries and applications. As the name implies, Reel Tech specialises not only in the supply of standard spring rewind, manual and motorised hose and cable reels, but also custom-engineered reeling solutions. With the technical capabilities to provide unique solutions for its clients’ strict reeling design specifications, environments and work duties as used in heavy resource industries such as mining and offshore oil and gas. Reel Tech, as well as being a Hannay Reel partner company, also hold many unique hose reel design patents for their own specific application hose reel designs, covering special safer rewind speed gear boxes, hose de-clutching systems to reduce operator injury, hose layering and remote control accessories designed to increase productivity, reduce costs and work place injury associated with unsafe hose handling practices on many mine sites. A recent large project undertaken by Reel Tech’s experienced design and fabrication team, involved a brief from one of Australia’s largest miners, requiring a high level of engineering design expertise to solve the customer’s existing hose handling problems with their existing outdated and older hose storage reeling systems. The customer’s problems onsite with their existing reel related to not only the type of reel, but the way it operated with the hose they needed to use to convey their particular fluid. 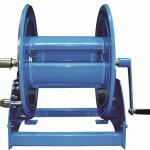 It is a common misbelief that one reel will suit applications; this is far from reality, as hoses and cables will wrap and act differently under various operating conditions, which can include operating pressure; outside temperature; whether or not the hose is being pulsed via a pump; or even the weight of the hose and the direction it is being paid out and in (i.e. vertical or horizontal). The mining customer in question had a critical application where the reel had to work whenever it was needed and even more importantly, it was a single-person application for that section, therefore, when required, the reel had to pay out and rewind without fail. It was found that the existing reeling system, in conjunction with the hose type, bend radius and operating temperature, as well as the constant on/off operation, was causing the hose to constantly bunch up whilst travelling, making it difficult to reel out. This required human intervention, which then effected the other operations in that area, causing an operational delay and bottleneck. In consultation with the customer, Reel Tech suggested conducting some trials on a mock-up reel with a representative sample of the hose type that they needed to use, and found that a single wrap style (Mono-Spiral Wrap) hose reel design, with Reel-Tech’s custom roller hose guide system, would prove to be more effective in combating their hose-spool bunching and, ultimately, their binding problem. 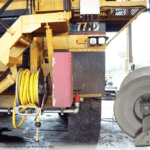 However, due to the nature of the application and the size of the hoses used on these large service reels, there were no standard off-the-shelf reels available locally. Reel Tech was commissioned to design and construct a custom reel solution based on the mock ups undertaken that could offer them the right solution. These reels were supplied with custom hydraulic drives and enclosed safety panels that can be easily removed in the field for instant service access if required. With a smaller footprint, the reels took up less space on their work platform, and they have re-introduced a higher level of safety, productivity and reliability to their mine site application. After further discussion with the client on their exact requirements, Reel Tech developed a unique custom hose reel design, possibly a world first, to meet their specifications, which has been derived from its industry-leading, purpose-built, heavy-duty mining reels called the Pit Bull mining series reeling technology. The Pit Bull reels are manufactured in Australia with hot dip galvanised frame and disc components to reduce corrosion and the need to repaint reels in service and with Reel Tech’s patented safety direct drive, reduced-speed torque gearbox and stainless steel full flow hub, fasteners and hose guide as standard. Most people don’t know that Pit Bull reels are designed with the patented Quick Change Hub technology, which allows quick change hose sizes and diameters with the need to change the entire reel, this allowing quick field upgrades and ex-stock solutions. When designing new innovations, Reel Tech’s core focus is on the ease of use and handling safety. 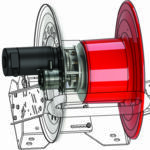 Pit Bull reels can be integrated with a gearbox called Ezi-Deploy. 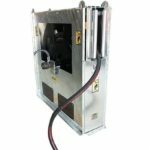 This is an auto declutching system that allows for easy deployment with the lowest resistance, thus reducing operator strain injuries and excessive force that can prematurely damage equipment. With no levers, buttons or electronics required, operator can simply pull and go. Reel Tech has delivered numerous custom solutions from narrow reels for smaller space to fully automatic oversized reels for all sizes and applications, as well as operating environments. For information about custom solutions, contact Reel Tech at sales@reeltech.com.au.